This year the Norwegian Modern fair will be held at DogA in Oslo. The event will exhibit and sell Norwegian Modern furniture, lighting, ceramics and glass from 1930 - 1970, as well as international classics from the same period. Join us on Saturday 16th and Sunday 17th of September 11.00 - 1700. Join us ! 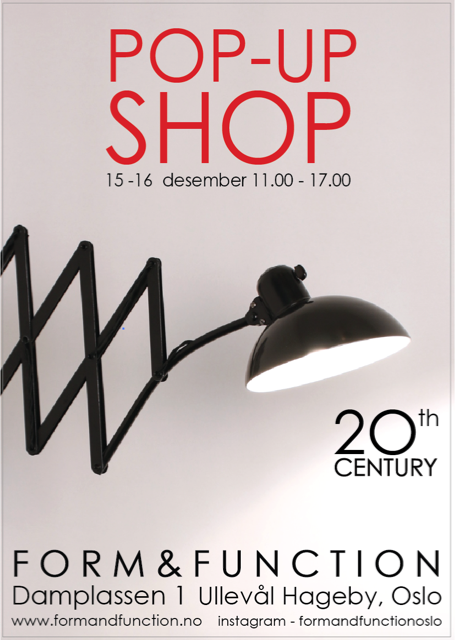 Pop-up shop - the very last week ! We will continue with our pop-up shop in Damplassen 1, Ullevål Hageby, Oslo. This will be our very last week. Come and visit us ! The pop-up shop will continue ! We will continue with our pop-up shop in Damplassen 1, Ullevål Hageby, Oslo, for a few more weeks. From November 10th you can visit us in Damplassen 1, Ullevål Hageby, Oslo. For the second time Nordic Design Fair is held at Doga (Norsk design- og arkitektursenter), Hausmanns gate 16, Oslo, Norway. A must-visit event for anyone interested in mid-century design ! After 20 years of collection, 10 years talking about a shop, 1 year planning, 4 weeks building a website, taking photos and designing a logo, there is 4 days left to launch our website and our first Nomadic shop at Nordic Design Fair. Welcome to Doga (Norsk design- og arkitektursenter), Hausmanns gate 16, Oslo, Norway.